If you have significant knowledge in a certain area, shouldn’t you be given college credit for it? The College Board agrees, and that’s why the CLEP exists. Taking a subject test in an area you know can earn you credit and save you time and money. However, if you can’t afford the fee, you can write a waiver letter to request an exemption. Let us guide you through this process of CLEP exam fee. The College-Level Examination Program, shortened to CLEP, is an American exam that allows you to earn college credits without taking classes. Adults just entering or returning to school, military personnel, and traditional university students are all candidates for the exam. There are many reasons why you may need to write a CLEP waiver letter. You may need to write one if you want to waive your exam scores. If this is your case, you should contact the school administration before sending a waiver letter and ask them for the admission requirements. You could also need to write a waiver letter if you want to ask for a CLEP fee waiver. In this case, you should write a CLEP exam fee waiver letter where you include evidence of your financial situation and arguments as to why the college should grant you that request. This can vary from one school to another, so, again, contact the institution in advance. Here’s how to write a fee CLEP waiver if you qualify for it. 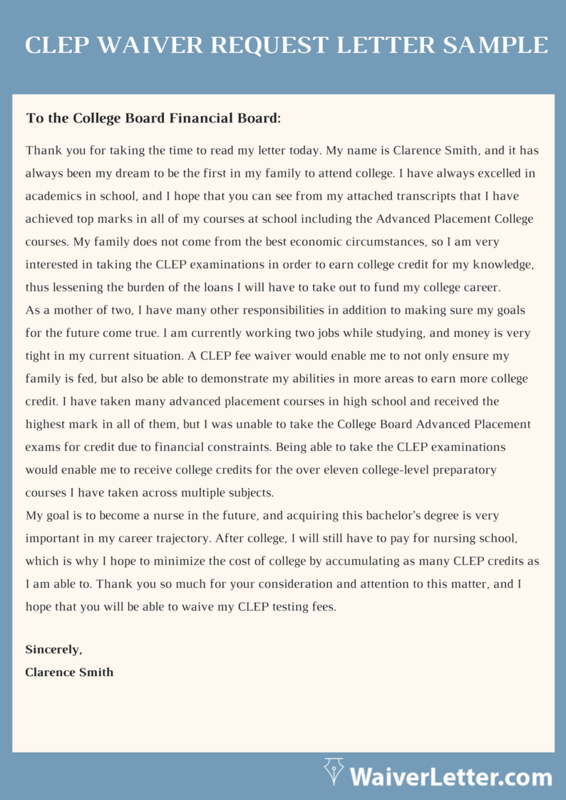 Can I ask for CLEP® help with the exam fee? 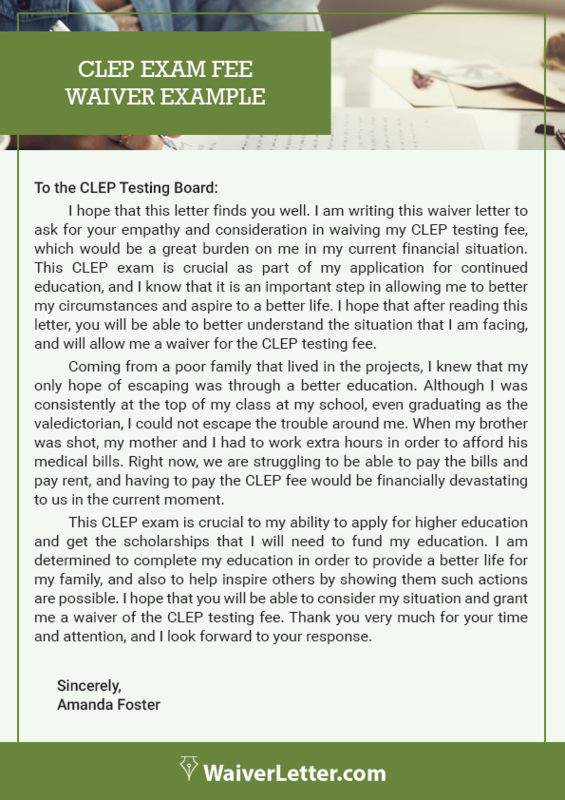 Yes, you can ask for a CLEP exam fee waiver through a waiver letter with our CLEP help it’s much easier. However, there are institutions that do not accept fee waiver, or they only grant a limited number. Make sure you contact your school in advance and ask them for the requirements and if they accept waiver letters. If you want to write one, make sure you attach substantial evidence that can help the admission board know your financial situation. Can I present a CLEP waiver for one of the subjects in the test? Yes. If you do not want to take a part of the test, let’s say English for example, you can present a waiver letter detailing your English level. It should be well-written and include persuasive arguments that will help you get your petition accepted. How can I request a fee waiver? If you want to request a CLEP fee waiver, you will have to write a compelling waiver letter. In this letter, you should explain why you are asking for a fee waiver and include evidence to help you make your case. This can be hard copies from your bank statement or any other paper that can reflect your financial situation. Attaching copies to your CLEP waiver will help you make your case and you will have better chances at getting that fee waiver. How can you structure your waiver request for CLEP exam fee? Follow this CLEP help outline and you’ll have a solid CLEP fee waiver. Write the date you are composing your letter. Skip two lines, add the name and address of who you’re sending it to. Skip another two lines. Write your greeting, such as ‘Dear [name]’. Go to the next paragraph and write an introduction. State your name and why you’re writing. Add one or two body paragraphs with your supporting evidence. Finish up with a short paragraph thanking your reader for their time. Skip two more lines and then add your closing (‘Sincerely’, ‘Best regards’, etc). Go down four lines, type your name, and then print it out. Sign your letter and send it! These five mistakes are very common when writing the CLEP waiver letter. Avoid them and your letter will be much stronger with our CLEP help. Too little detail: Make sure you include all the important reasons why you should be given a waiver. Incomplete arguments make you a weak candidate. Too much detail: You also don’t want to include every single little thing about your current situation. Only relevant information, please. Poor structure: Don’t make your reader wade through the least important stuff first. Put the crucial facts early in the letter and supporting evidence later. Lack of name: Addressing a letter to ‘To whom it may concern’ or ‘Sir or Madam’ is a major faux pas. Find the right name. Typos: A typo can completely destroy an otherwise beautiful letter. Avoid this by having someone check your letter before you send it. Click here and explore PRAXIS waiver sample letter all tricks of writing it! How to Make a Perfect Waiver? There’s no doubt about it – the CLEP is a valuable exam. However, writing your fee waiver for school early is crucial if you plan to take it. We know what a daunting task this can be, and so we offer you our assistance. Let our staff of trained writers take on the burden of writing for you, get the CLEP help. You’ll thank yourself later. We want you to go back to us each and whenever you want help together with your writing. Our aim is usually to make certain that you may be completely glad about the writing that we offer for you. Through us, all of the help and ensures that you want with a view too with a bit of luck making your order you may continually gain from relevantly qualified and noticeably skilled writers. You want our service as a way to provide you with an author that absolutely understands what’s required out of your waiver request letter and know about the CLEP exam fee waiver. Our writing service is carried out by professional writers that are specialized in various fields. They have many years of experience writing waiver letters and can help you write and polish a waiver letter for different situations. They know how to write catchy sentences that will persuade the reader to grant you that waiver. Our professional writers will tailor your letter according to your needs so you can be sure you will receive a personal waiver letter that you can present as soon as you get it, they provide a good CLEP help. We work with skilled editors to offer a top-notch editing service. Our professional editors have excellent editing skills and can catch any mistake in the blink of an eye. They will revise your CLEP exam fee waiver letter thoroughly and make the necessary changes to ensure it is well-written and compelling. You could simply fill out an online shape and offer the specified info to place your order via our website. You’re now equipped to make a charge after filling out the information. You will then get an email affirmation of your order as soon as the fee is made. Customers will have direct communique with the writer all throughout the system. All of the details you furnished in the online form will then be forwarded to the assigned writer. You could make the effort to study and touch upon the draft and the author will ship the first draft. If there may be none, you may get hold of the final draft if there are revisions wanted, you may request for revisions. Get the CLEP help now! For the best value on CLEP fee waiver letters, contact us now and experience the benefits of professional service.